Performances and installations in Saudi Arabia with social, ecological and political concerns. Abdulnasser Gharem is unique in the history of Saudi Arabian contemporary art. No-one else has combined a career in the Saudi Arabian Army with life as an artist specialising in performance and site-specific installation. Gharem's studio is the street (or wherever he locates an artistic opportunity). Critically, he's someone who understands the value of contingency. This is at the heart of his practice alongside his social, ecological or political concerns. Along with Ahmed Mater, Gharem is one of the stars of 'Edge of Arabia', the first comprehensive exhibition of Saudi contemporary art in London. It opened on 15 October 2008 in the Brunei Gallery. Born in 1973 in Khamis Mushait, near Abha, Gharem studied at Al-Miftaha Artists' Village before moving away from painting towards performance. One of his earliest pieces, displayed in the recent Sharjah Biennial 2007, was Flora and Fauna. This documented a performance in Abha for which he wrapped one of the Cornocarpus Erectus trees running down the main street in a sheet of plastic and remained in there all day, surviving on the oxygen produced by the tree. It was a neat exploration of man's relationship with his environment as well as the role of technocrats in urban redesign. These trees, a regular sight in Abha, were imported from Australia and although they produce impressive quantities of oxygen they have had a disastrous effect on the local tree population. Henry Hemming: What kind of reaction did you get to this piece – you mentioned earlier this was the first time anything like this had happened in Abha? Abdulnasser Gharem: People thought I was crazy. But they wanted to know more. Their minds are not closed so they came over to ask about it. When they understood it, they liked it. HH: If you had the power would you remove all the Cornocarpus Erectus trees from Abha? AG: Directly. But what's more important are the lessons for the future. Our architects and planners need to consider the environment more carefully in their designs. Our technology needs to accelerate in this sense. We need a philosophical analysis of the relationship between the technological and the natural. HH: Can you explain the background to the piece you created a little further away from here in the Tihama Strip , Al Siraat? AG: The background to this is the history of the bridge. In 1982 one day word spread following heavy rain that a flash-flood was about to sweep down the valley. So the villagers near this bridge decided to shelter on the concrete bridge. They put their faith in concrete. They gathered there with their vehicles and livestock and waited. The flood came, yet it washed away both the bridge and the people on it. 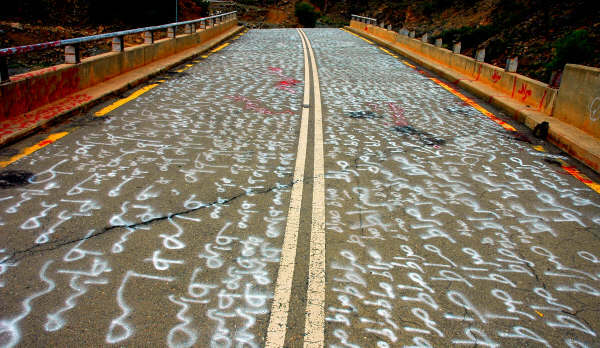 Many years later I have covered the remains of this bridge with one word: Al Siraat. It took three days of intense labour with many helpers to achieve this. In Arabic Al Siraat can mean 'the path' or 'the way' in the spiritual sense of the word: it's about the choices you make in life, and whether or not you follow the straight path. It can also refer to the bridge that you face when you die connecting this world and the next. Gharem has left details of the location of this piece on his website and receives regular emails from art tourists who come down from Riyadh to visit it. It is gaining something of a cult following, and rightly so. It is an impressive piece: an ideal marriage of form and geographic context; concept to execution; memory with time; international contemporary art to Saudi present-day culture. "But you know what was at the centre of this piece?" Gharem adds. "Chance. I saw this bridge, learnt its history, and improvised. I'm always rethinking. And this is so important for me. I have no studio so my studio is wherever I can find people, or their trace. When I see the opportunity I must take it." In Chance and Necessity, the Nobel Laureate and French biochemist Jacques Monod argued that only with 'absolute chance' – i.e. coincidence, contingency, the collision that occurs when two unrelated sequences join and there is someone to take advantage of this – do you find the possibility of 'absolute newness'. Gharem embodies that possibility. In a broader sense Gharem represents the past, present and future of contemporary art in Saudi Arabia. He began his career producing technically impressive watercolorist yet over the last eight years has adapted his technique to a dramatic broadening of his artistic horizons. What's impressive is the way he has responded to the inherent challenge or threat posed by Western contemporary art. Rather than imitate the most recent parts of this, or dream of leaving Saudi Arabia to make art abroad, Gharem has internalised its methodology and, with time, colonised it. The work he produces now is rooted absolutely in its (and his) geographic and social context. As he puts it: "The one thing I fear is running out of ideas, and this will happen only if I leave the country, or I stop talking to people." So his work represents a commentary and artistic engagement with his surroundings rather than a solipsistic critique. For Gharem and other like-minded innovators the future of the Saudi artist does not involve a man isolated in a studio, static before an easel with a palette round his thumb, and, metaphorically at least, a beret in place of a traditional headscarf. Instead the artist is a man or woman who can recognise contingency and fashion it to his or her advantage. They are not there to protest, or create beauty for the sake of beauty. There is instead an aesthetic charge to be found in the reality of the processes they enact. Tihama Strip: A narrow coastal region running down the south-west coast of Arabia, derived geologically from the African mainland. * 1973 Khamis Mushayt, Saudi Arabia.